This year marks the 500th anniversary of the death of Leonardo da Vinci, the “universal genius,” and since I have been working a lot on him (two of my books in Italian on Leonardo just came out, and I am lecturing everywhere about him), I thought I would share with my readers some glimpses into the mind of this extraordinary man. Look at the drawing reproduced on this page. It is considered the oldest surviving drawing by Leonardo da Vinci. It was drawn in 1473 and depicts a Tuscan landscape, maybe near Vinci, the small town close to Florence where Leonardo was born. 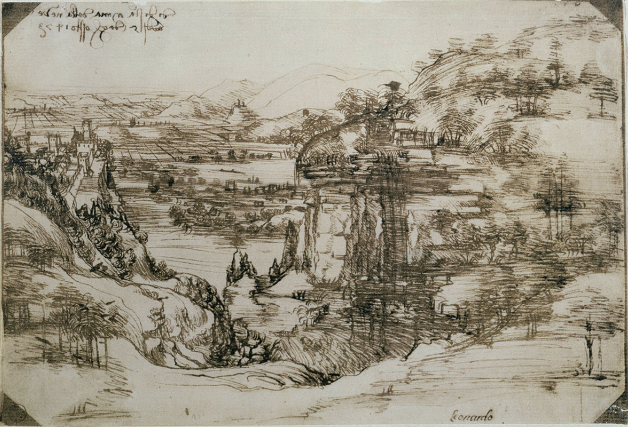 This drawing is considered the first “pure” landscape in Western art: a landscape that is drawn not to be the background of some religious scene or a portrait. It is the first time (at least the first documented occasion) where a landscape was drawn just for the sake of it. You can see that it was drawn quickly but with a precise hand: there are hills, trees, some castles in the distance, and water. Water especially is something that fascinated Leonardo for all of his life, and it’s already here, in his first drawing. But what is also interesting is the writing on the back of the drawing. In Leonardo’s backward handwriting it says: “I, staying with Anthony, am happy.” (Anthony was probably the husband of Leonardo’s mother.) It was, in fact, his grandparents who raised him, even though his parents were both alive; this fact is a key to understanding his upbringing and his very original way of thinking.